In Mr. Smith’s recent work there is evolving something like a thematic motley, for which the artist draws on widely traditional quarters for inspiration, such as the Bible and the Apocrypha, and the work of old masters, especially of Rembrandt. Mr. Smith has adapted poses found in two of Rembrandt’s self-portraits for use in two of his own. In his ‘Self-portrait with Blue Lips”, Mr. Smith borrows from Rembrandt in a way as if Mr. Smith, through the bit of waggishness in his own version, were just this side of poking fun at himself, at a certain presumptuousness of successors to a great legacy of artistic invention and execution. But a younger artist’s natural regard for established standards need not become a burden for him; on the contrary, precedence, however awesome, is itself the realm in which the hidden beginnings for some fresh expansion of the old excellence often lie. With a profound understanding of an earlier master’s grace, the artist, by patient exploration of its richness, by employing his own creativity in painstaking experimentation with that richness, can produce something novel, non imitative. 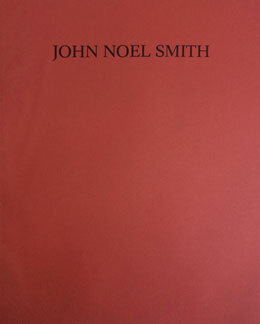 John Noel Smith – Paintings / Pastels. Berlin: Galerie Folker Skulima, Volker Diehl, Galleri Lars Bohman, Galerie Pilou Asbeck, 1989.